Jazeman Jaafar enjoyed another strong weekend of racing in the Cooper Tires British Formula 3 International Series at Oulton Park in Cheshire. Scoring his third podium finish, with a third place finish in the first race, Jaafar backed up this excellent performance with two further top six finishes, posting a fourth place in the second race and sixth place in the final race of the day. 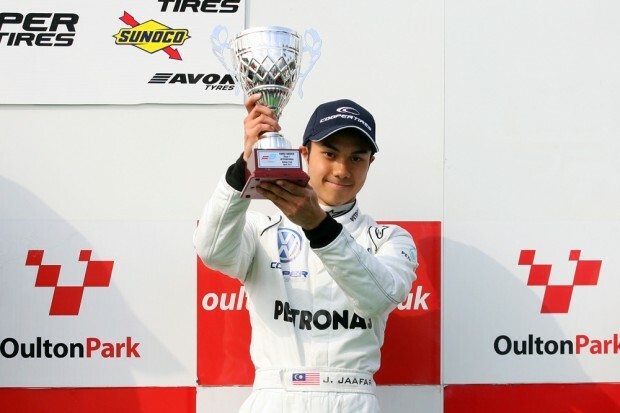 These results ensured Jaafar maintained his second place position in the overall drivers standings, after the first two events of the ten-round British F3 series. The 18-year-old Malaysian driver began his 2011 British F3 campaign in Monza last week, with two podiums and a fourth place finish. Less than a week later he was back on track, preparing for the next three races at the Cheshire circuit. He continued the momentum built in Monza in the practice sessions, and despite an accident which curtailed his running, he posted impressive qualifying times which put him fourth on the grid for the first race and fifth on the grid for the third race, with his grid position for the second race being determined by his result from the first race and the British F3 top six reverse grid format. Petronas-backed Jaafar made a good start in the first of the three races, slotting into fourth place as the green flag flew and the pack streamed down to the first corner. The Oulton Park track proved difficult ground for any of the drivers to make overtaking manoeuvres, but Jaafar was able to gain a place after Manasheh Idafar crashed out ahead of him, elevating him to third position and on to the podium. The reverse grid format put Jaafar sixth on the grid for the start of the second race. Quick off the line, Jaafar was up to fourth after the first corner and hunting down third placed Will Buller. Jaafar closed up on his rival as the race progressed, but with the high downforce nature of the track, he wasn’t able to get close enough to overtake and was forced to settle for another strong points finish. The final race of the day rounded off Jaafar’s weekend, with the young driver suffering wheel spin off the line which lost him a place at the start. Running in sixth place Jaafar held position throughout the 26 laps race distance, to post more valuable championship points. The Cooper Tire British Formula 3 International Series continues with the third event of the season taking place at Snetterton race circuit in Norfolk from 24 to 25 May.